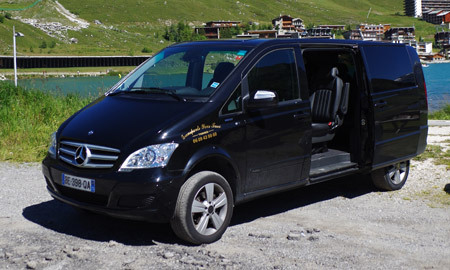 Yves Taxis offers will take you to Val d'Isère form the train stations and airports of the area. Located in the Haute-Tarentaise valley, at 40 minutes form Bourg-Saint-Maurice, the resort shares its ski area with Tignes, under the name of Espace Killy. Well known all over the world, the ski area offers all kinds of slopes, great for beginners but also for skilled off-piste skiers and freestyle snowboarders. The village is famed for its top of the range hotels, restaurants and prestigious chalets with associated services. Skiers and tourists in Val d'Isère are often looking for high quality services for a great experience. That is why Yves Taxis offers a special Limousine service, with a comfortable and well-equipped Mercedes Viano up to 7 passengers. Feel free to ask for a quotation by clicking here, or to contact us by phone.